Juvenile xanthogranuloma (JXG) is a non-Langerhans cell histiocytic disorder and has many different forms. Juvenile xanthogranuloma (JXG) is a non-Langerhans cell histiocytic disorder and has many different forms, including classic, giant, clustered, intraoral, systemic, intraocular, subcutaneous and intramuscular. Congenital giant JXG is a rare presentation of this non-Langerhans cell histiocytic disorder and even rarer are incidences of ulceration at birth. We report a case of congenital giant JXG with ulceration present at birth which was mistakenly diagnosed as a hemangioma. Such a manifestation of giant JXG has rarely been reported in the literature. A 3-month-old female patient was referred with an ulcerated nodule over her back since birth. The lesion was not increasing in size. There was occasional bleeding but no pain or pruritus. She was otherwise feeding well and growing appropriately. There was no personal or family history of any skin tumors or infectious diseases. Physical examination revealed a nodular plaque measuring 6 by 6 cm over the left paravertebral space. The nodular plaque was ulcerated with healthy granulation tissue and some serous discharge [Figure 1]. There were no other suspicious skin lesions neither were there lymphadenopathy or organomegaly. There were also no mucosal lesions and opthalmological examination was normal. Full blood count was within normal limits (hemoglobin 10.0g/dl, total white cell count 16.12 × 10 9 /L, platelet count 154 × 10 6 /L). Coagulation profile was also normal (Prothrombin time 13.4 seconds, activated partial thromboplastin time 42.8 seconds). Ultrasound of the lesion was reported as subcutaneous soft tissue lesion most likely represent hemangioma with vascularity noted on color Doppler. 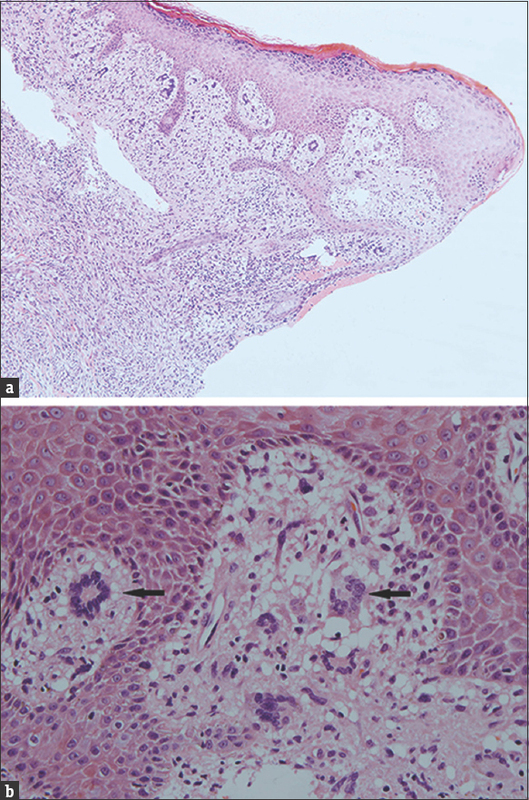 Histopathology examination of a skin biopsy specimen revealed dense dermal infiltrate of foamy histiocytes, foreign body, and Touton giant cells (black arrow) [Figure 2]a and b]. Immunohistochemically histiocytes were negative for s100, cd1a, toulidine blue and positive for CD68 which confirms the diagnosis of JXG. The patient was managed conservatively with dressing and antibiotics. The lesion regressed spontaneously and at 9 months old there was a hyperpigmented atrophic plaque remaining [Figure 3]. We report a case of a solitary ulcerated congenital giant JXG in an infant. JXG is a reactive proliferative disorder of lipid-laden histiocytes which presents in many forms. The classic form is commoner in males and appear as solitary or multiple yellowish nodule or papule over head and neck, upper torso and extremities with 20% appearing at birth. Lesions larger than 20 mm in diameter are classified as giant JXG. Unlike classic JXG, female predominance is found in giant JXG with common localization to the proximal extremities and upper back. , Literature review by Ceyhan et al. showed that only 13 cases of congenital giant JXG were reported in the literature. Our case appears as a large single mass unlike other reports of giant JXG appearing as a plaque studded with papules or plaque associated with cluster of papules at the periphery. ,,, There is high tendency for giant JXG to ulcerate possibly due to continued rubbing of the lesions. However, in most instances the ulceration is not present at birth unlike our case. Giant JXG is commonly mistaken for other diagnosis including congenital hemangioma. Other diagnosis that should be considered includes rhabdomyosarcoma, giant cell fibroblastoma, juvenile nodular fasciitis, dermatofibrosarcoma protruberans, and other soft tissue neoplasms. These were excluded by the histopathology results in our case. Histopathologically, JXG is characterized by a dense dermal inﬁltrate composed primarily of histiocytes, with foam cells and multinucleated Touton-type giant cells, characterized by a wreath of nuclei surrounded by foamy cytoplasm. Touton giant cells are nearly pathognomonic of JXG. On immunohistochemistry staining, histiocytes are CD68 positive and S100 negative thus excluding Langerhans cell histiocytosis. However, there is a wide spectrum of histopathological changes in JXG and immature lesions may lack Touton giant cells and lipidization in histiocytes. The histopathological examination in our patient showed dense dermal infiltrate of foamy histiocytes and Touton giant cells characteristic of JXG. We report a case of a solitary congenital giant JXG in an infant complicated by ulceration and infection. This case emphasizes the importance of being aware of the myriad presentations of JXG in order to make a correct diagnosis and avoid unnecessary investigations or treatment. Diagnosis of JXG may be a challenge if it is not considered in the differential diagnosis and immunohistochemical staining is important to differentiate from Langerhans cell histiocytosis. Chang MW. Update on juvenile xanthogranuloma: Unusual cutaneous and systemic variants. Semin Cutan Med Surg 1999;18:195-205. Ceyhan AM, Aynali G, Chen W, Kapucuoglu N. Congenital giant juvenile xanthogranuloma initially masquerading as hemangioma. Eur J Dermatol 2011;21:431-3. Imiela A, Carpentier O, Segard-Drouard M, Martin de Lassalle E, Piette F. Juvenile xanthogranuloma: A congenital giant form leading to a wide atrophic sequela. Pediatr Dermatol 2004;21:121-3. Clayton TH, Holder JE, Clark SM. Solitary giant juvenile xanthogranuloma presenting in a neonate. Br J Dermatol 2004;15 1Suppl 68:67-79. Yazganoglu KD, Erdem Y, Buyukbabani N, Baykal C. A giant congenital plaque. Pediatr Dermatol 2012;29:217-8. Clayton TH, Mitra A, Holder J, Clark SM. Congenital plaque on the chest. Diagnosis: Solitary giant congenital juvenile xanthogranuloma. Clin Exp Dermatol 2007;32:613-4. Kuramoto N, Nakamichi H, Kishimoto S. Ulcerated giant juvenile xanthogranuloma accompanied by hyperlipidaemia. Acta Derm Venereol 2002;82:210-1. Azorín D, Torrelo A, Lassaletta A, de Prada I, Colmenero I, Contra T, et al. Systemic juvenile xanthogranuloma with fatal outcome. Pediatr Dermatol 2009;26:709-12. Giant JXG presenting at birth with ulceration is rare. It is often mistakenly diagnosed as other conditions. Histopathological examination is essential in confirming the diagnosis.